S-6s is ideal for the most-demanding sweeping applications. The environmentally conscious S-6s is SCAQMD PM-10 Rule 1186 Certified. 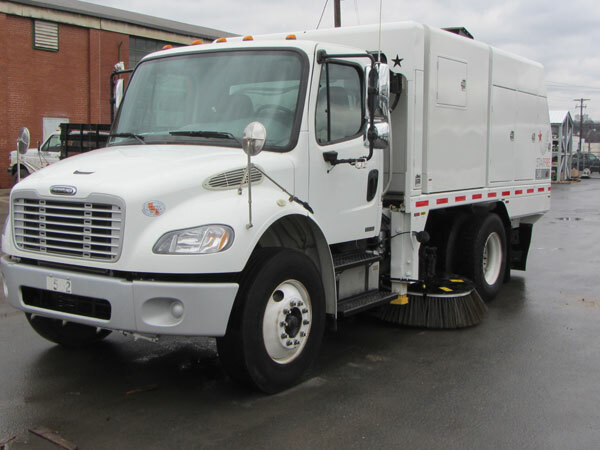 All Starfire models are equipped with unique features designed to make your sweeping tasks safer, easier and more cost effective. Off-set hydraulic elevator drive motor is protected against shock loading. Electrical relays & fuses are protected from the elements in a sealed NEMA 4 enclosure. The wiring is heat stamped with numbers for easy identification. 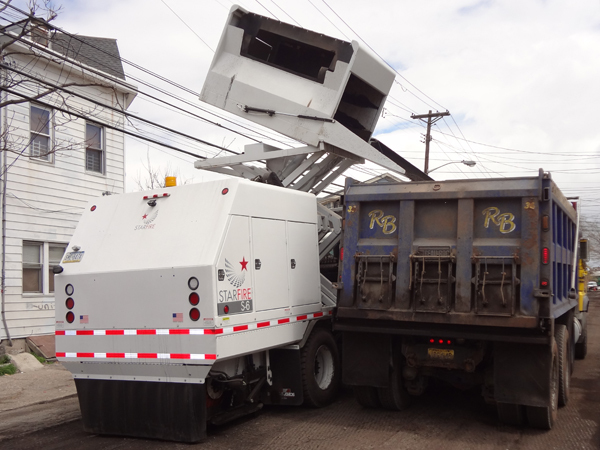 Massive double “X” style lift scissors & 4-corner hopper lift ensure exceptional hopper stability when dumping wet, unbalanced, or sticky debris. 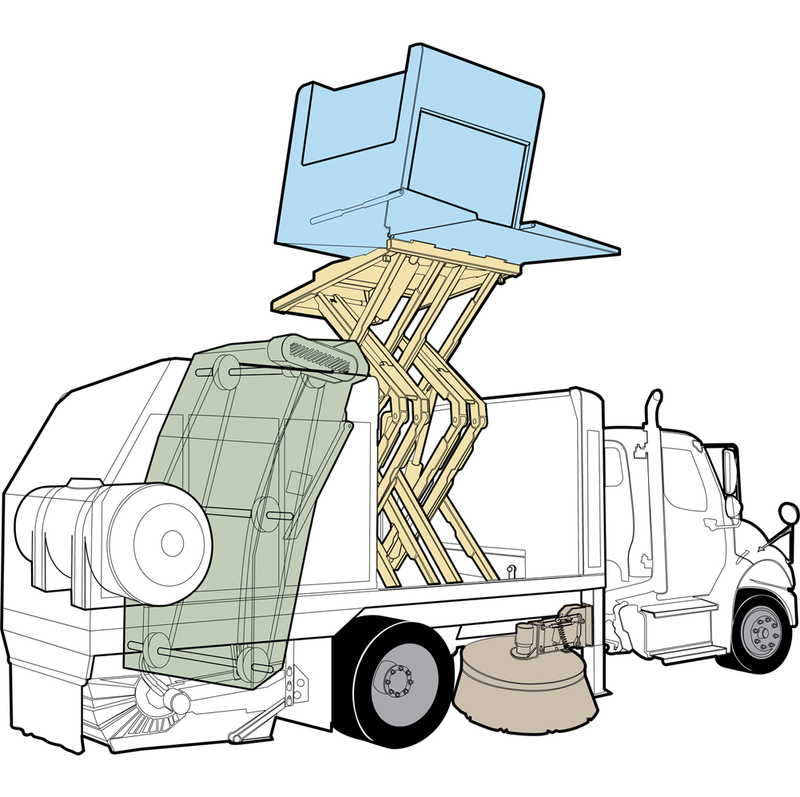 Variable dump height hopper (up to 12' 2" high) with 54" extra-long dump door easily reaches most dump trucks. Main broom channeler (optional) effectively sweeps large quantities or bulky & light debris (leaves/pine straw). Self-adjusting as main broom wears. Large 350 gallon polyethylene water tank with 3.6 gpm diaphragm pump & elevator wash-down system come standard. Spray nozzles: 3 per gutter broom, 4 on main broom & 4 on front spray bar. One-piece all steel main frame consists of HD tube and thick liners. This structure allows for rugged & reliable durability. 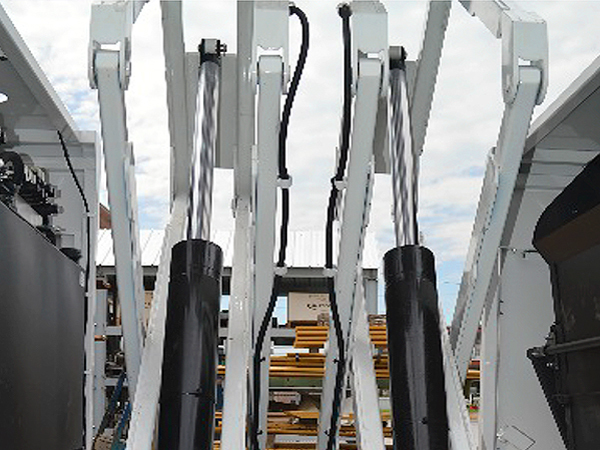 Elevator auto pivots up to 10" over fixed obstructions preventing impact damage. No operator judgment required. Unit is standard with a PTO-driven variable displacement, double piston, load sensing hydraulic pump. Each pump is 12 gpm @ 1100 rpm. S-6s (single engine) components powered by chassis power take-off (PTO). PTO is "hot shift" and over speed protected, which provides reliable operation while sweeping or driving when PTO has not been shut down. Vertically-mounted control panel is 6-way adjustable for easy & ergonomic viewing. One-touch sweeping allows for operator to preset functions. Brooms raise automatically in reverse. "Effectively simple" electric-over hydraulic system with built-in hydraulic pressure gauges for ease of service. EXTENDED CHAIN LIFE.3rd shaft provides proper return (upper) chain support. This allows chains to run as loose as possible dramatically improving chain wear life versus similar 2-shaft designs. REDUCED MAINTENANCE COSTS. 3rd shaft provides twice the number of chain adjustment points. Together with reduced chain wear, this significantly reduces maintenance downtime & costs versus 2-shaft designs. BETTER LOADING/SWEEPING PERFORMANCE. Eliminates chain clapping common in 2-shaft designs. 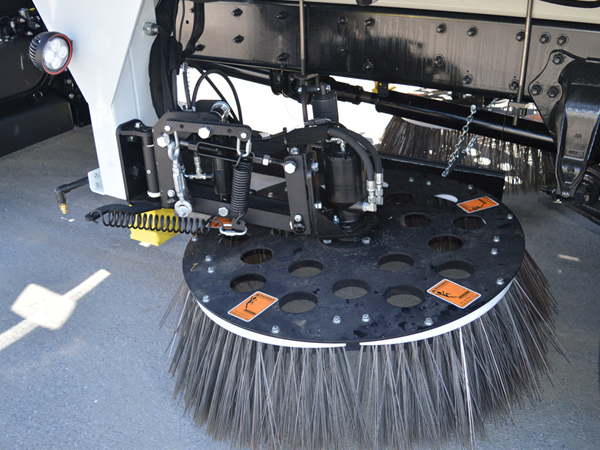 3rd shaft optimizes chain spacing, reduces clogging & ensures more effective sweeping of large, bulky debris. Electric-powered, continuous-running hydraulic oil cooler is roof-mounted to prevent clogging & provide maximum cooling. Color camera system keeps operator facing forward. 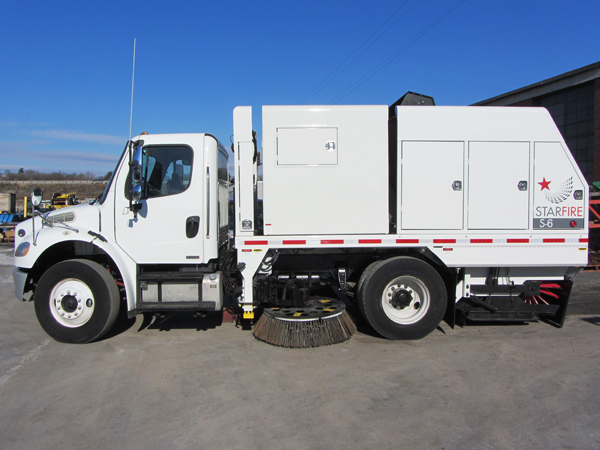 Sweeper comes standard with dashboard-mounted 7″ color monitor with right gutter broom & rear backup cameras. Optional hopper dump observation & hopper inside loading view cameras are available. Available on your choice of 33,000# GVWR chassis. Optional air ride suspension is standard. Rear lockable canopies protect components from passing branches, elements & vandalism. Canopies prevent algae growth in water tank which can clog spray nozzles. Case drains for all the hydraulic motors protect shaft seals from pressure leaks minimizing repairs & replacements. Spring-balanced, free-floating main & gutter brooms automatically apply correct surface pressure for maximum broom wear life. 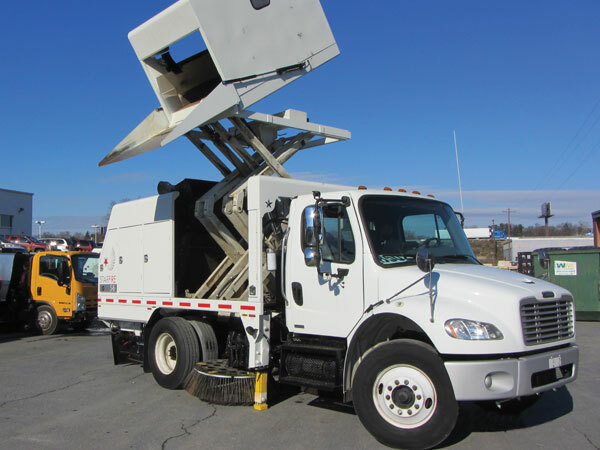 In-cab gutter broom electric tilt is standard. Front stabilizers automatically deploy during hopper dumping to provide added safety & stability when dumping heavy, sticky, or unbalanced loads. Extended 12-flight elevator maximizes hopper loading by filling from the top down, not from the side. Top loading reduces unused hopper space increasing productivity. 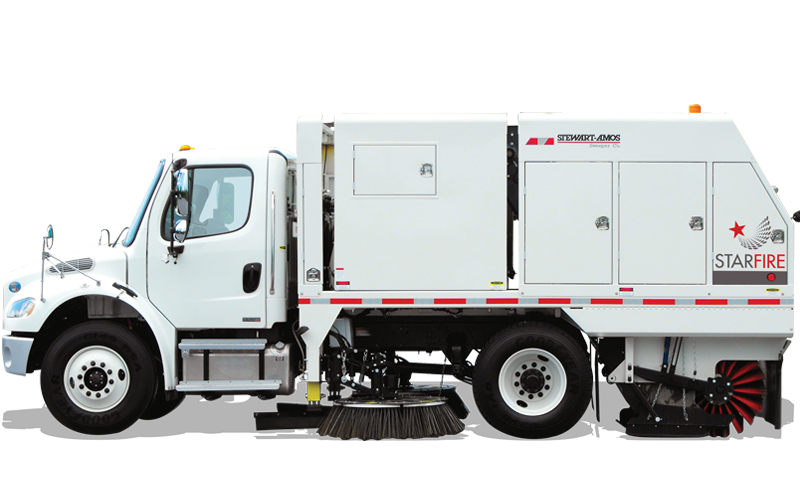 Learn more about our Starfire S-6s Mechanical Broom Sweepers.